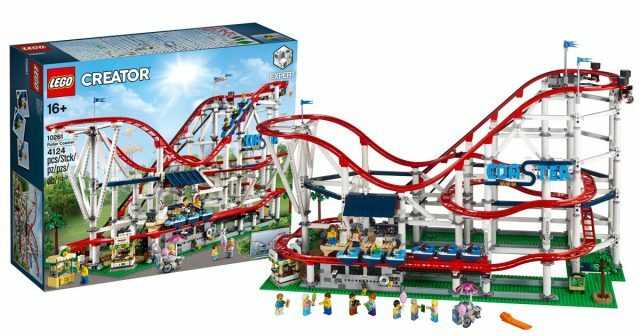 One of the most anticipated sets in recent memory, the huge Creator Expert 10261 Roller Coaster is now available to LEGO VIP members — you must be logged in for it to appear available. It will be available June 1 for non-members. The coaster puts to full use LEGO brand new roller coaster system of pieces that was first revealed in The Joker Manor last year, and it includes several new elements for the first time. The coaster can be hand-cranked or combined with Power Functions for a fully automated track. The set includes 4,124 pieces and 11 minifigures for $379.99 USD. If you’re not already a LEGO VIP member, signing up is free and nets you rewards on every purchase from LEGO, both online and in LEGO Brand Retail stores. Check out more pictures of the Roller Coaster in our announcement article, and watch for our hands-on review coming soon! [Update] Some of our readers are also reporting that LEGO has acknowledged a glitch in the ordering system for some users, causing it to appear unavailable, despite being available. No, it’s not – as usual, the website doesn’t work and shows availability for June 1 still. I thought there was 2 exclusive set for Mary 16. what is the other one? It is still not working as of 7:30 am EST. Note: you must be logged in to your VIP account for it to appear available. I’ve updated the article to make that more explicit. Some of our readers are also reporting that LEGO has acknowledged a glitch in the ordering system for some users, despite the set being available.